Thank you all for your fantastic feedback about the track and our facilities! "Today, the Hump Ridge continues to inspire those who climb it. Photographers delight in the tors and tarns at the summit. Dunedin artist Peter Belton, who climbed the ridge last year, has produced a series of drawings of the summit rocks, which, he says,suggest animal forms. For most trampers, the views alone - extending from Fiordland to Stewart Island - are worth the effort of the climb. On a clear day,it's not hard for anyone to believe they are on top of the world. "The Tuatapere Hump Ridge Track is a phenomenal spot to visit and to photograph. It's a three-day trek, but we cheated and did it faster in a chopper due to time constraints... ... at Port Craig where there are these incredible sunrises over the water to wake up to." "And then there's the beauty of the Hump Ridge. 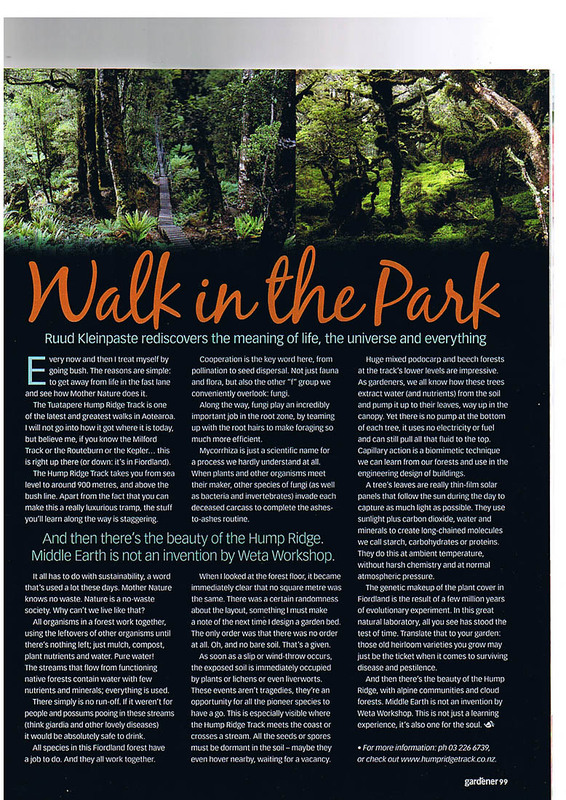 Middle Earth is not an invention by Weta Workshop. This is not just a learning experience, it's also one for the soul." "by 9.00am we were on the coast, a wild expanse of driftwood-littered sand and glittering ocean with the dim bulk of Stewart Island on the horizon." "It's two weeks since I walked the track. It was a fantastic experience, the scenery, the Lodges, the people, everything about the place made me proud to be a Kiwi. I just want to thank everyone involved and especially Liz at Okaka and Ali at Port Craig. Both were wonderful hosts. I am singing the praises of the Track and all involved to anyone who will listen. More Kiwis should get off their backsides and experience this special place. I have been to many countries in the world and seen many great things: this is right up there with the best of them." 31 Dec 2010: "Dear Everyone involved in the Hump Ridge Track. Many thanks from us to you all for a most memorable 3 days and nights. 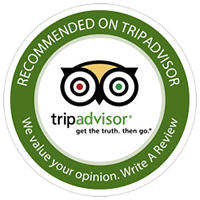 We thoroughly enjoyed the experience and will recommend it to everyone. Everything was excellent, totally worldclass! Cheers to you all, The Macdonald 5." 17 Dec 2010: "The best tramp I've done in NZ! Excellent scenery, luxury lodges and not crowded." 10 Dec 2010: "Keep doing what you are doing." 21 March 2010. I really enjoyed this tramp, amazing experience, would definitely recommend it to others! 31 March 2010. The trust has done a fantastic job. Every other Doc hut is going to be ordinary compared to this - I mean showers! Wow! Impressive Community Effort - Keep up the good work! The Tuatapere Community should feel proud of what they have achieved - I certainly felt proud of them whilst walking the track. Fantastic Tramp - thanks for making it possible. Not a bad way to spend a couple of days - truly gorgeous!!! An outstanding experience - made even better by good food, accommodation and outstanding hospitality at all stops. This is one of the best tracks I have ever done - Long days but very worth it. All in all, this tramp has been a very interesting and challenging experience. The Trust is to be congradulated on the huge investment made. A really excellent experience, thank you for all your hard work. Excellent porridge! A wonderful experience - all kiwi's should do this track. Love the info Noelene shared with us about the nature, trees and animals. Hut wardens did a fantastic job - GREAT PORRIDGE!!!! I have only the highest praise for the help and assistance that I have had as a result of my "Boardwalk Incident" I shall be singing your praises. Great Experience. I think it is great the Tuatapere Community is involved with the track. Keep up the Good work, Awesome Track and facilities. Having porridge served to us each morning was very nice. The option to buy various items from each Lodge was also very civilised. Finally the option to helipack and upgrade room options -all make for a very unique and memorable walk that is within everyone's capabilities and reach. Very well organised! What a fantastic experience. Totally outstanding and well done Tuatapere Hump Track Trust. Keep doing what you are already doing - it works!! Love the fact that you cater for all types. I would sincerely like to thank the Trustees whose foresight and tenacity, with lots of hard work have made the Humpridge Track what it is. This 3 day adventure combines such a contrast of scenery and history of Port Craig, giving the walk plenty of variation. It was a real insight to read how the track came into being and made me even more grateful for having had the opportunity to enjoy its delights. I am not one to give top marks to lightly, so well done Humpridge Trust. Will recommend the track to all my friends. What was the most enjoyable part of your tramp? 21 March 2010. The viaducts and all the other features of Port Craig. And the mud! Views on Day 2 from around the Lodge. All of it - the Lodges are great, the wardens, the shelters and toilets along the track, the track, the views - all well thought out. Scenery, height, variety of vegetation, the history, photo boards MOST OF ALL the packs going by HELICOPTER!!!!!!!!!!!!! Day One - Snow - nature, a great guide and experience. Everting - the lodges, the wardens , the views. The company, the spectacular views. Day one - Rarakau to Okaka, the whole day was magnificent. View from the top of the Humpridge. The forest, the fauna, the hospitality, the showers and the artfulness of the boardwalks - superb!! Good weather, views, getting to the top and the history. So many things! , the fauna, the hospitality, the showers and the artfulness of the boardwalks - superb!! So many things! Excellent experience all around, especially the huts and managers.